Until May 24th (except on sunday and May 1st) the monumental video show is coming back in the Invalides. Reserve your tickets, for the new version of the show. 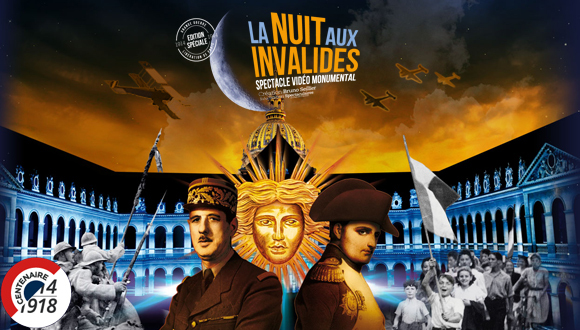 To commemorate the 100th anniversary of the First World War and the 70th anniversary of the Liberation of Paris, the show La Nuit aux Invalides has been revamped. With two performances per night at 9.30 and 10.30 p.m., for a 40-minute show. After the show, visit the Church’s Dome (tomb of Napoleon I). For the English speaking audiences, a soundtrack of « La Nuit aux Invalides » (voices only) is available (purchase through the Internet site, with the tickets). You can enjoy the show creator’s text, told by native English actors, before, after or during the show (earphones mandatory), at your convenience, on your smartphone (synchronization with ITunes if you’ve got an Iphone). However, the broadcasted voices at les Invalides still are those of the three comedians André Dussollier, Céline Duhamel and Jean Piat, in french.